Oxford University Press is the most famous publisher of course books in the world. In Pakistan too large number of schools are teaching books published by Oxford University Press. Specially more than 80% English medium schools are following the syllabus of Oxford University press. These books are much expensive than local books. There are large number of alternative syllabus books for students of Pakistani students. In fact books of Oxford University press have become status symbol in Pakistan. Paramount publisher, Gohar publishers, Reader Rehbar publishers, Javeed Book Depot, Alaf publishers and many more local publishers are also publishing quality syllabus books for school students, but still English medium schools are preferring books of Oxford University Press. Its just due to our national inferiority complex. English medium schools have become symbol of status quo in our society. We think that now these schools should patronize the local publishers too. On this page we have given the list of all syllabus books of Oxford University with price list. Never pay even a single rupee more than price given in this list. Remember that Oxford University price give handsome commission to schools on its syllabus books. So buy the books on the original price. There is no doubt that books published by Oxford University press are good in quality.We are not against them at all, we just want to suggest private English medium schools should encourage the good local publishers too. Oxford University Press releases its revised price list every year. 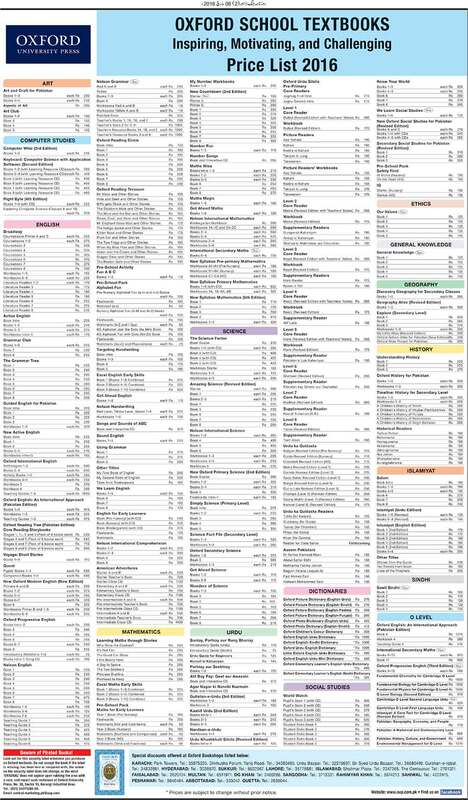 Price list for year 2019 has also been released. Large number of publishers are publishing pirated books of Oxford University Press. Never buy such books and inform the company immediately about such activities on the given contact numbers, Stay connected with studysolutions.pk and its facebook page for reading the list of books of famous publishers of Pakistan.